I hope everyone has been enjoying a great April but it's now time to review the latest movie for this blog. I've waited 10 years for this sequel to come out for this film franchise so what better selection to review than one of my favourite horror movies. The review today is the teen-horror slasher flick: Scream 4! The Premise: It's been over 10 years since the latest serial killings and Sydney Prescott (played by Neve Campbell) is settling down to a life of notoriety and seclusion. She's become a successful book author detailing the struggles of being a victim and her rise to be a strong female figure for helping women overcome their obstacles. When the last leg of her book tour takes her back home to Woodsboro, it seems that someone (conveniently wearing the Ghostface costume with a love of horror movie questions) plans to restart the killings with new victims and a whole new set of rules. There are two core groups interacting in this movie with their own storylines that intertwine. The first follows the original three: Sidney Prescott, Sheriff Dewey Riley (David Arquette) and his wife Gale Riley (Courtney Cox Arquette). This group I can reference as the adults and the original generation because everyone is a character that is clearly over the age of 23 and has lived through the events of the first trilogy whether it be a victim or a spectator watching the news. This story follows Sidney trying to protect the people around her with Dewey leading the investigation with his police force and Gale trying to uncover the identity of the killer while reverting back to her journalistic ways; even though she`s been officially retired for 10 years. The other core group in this film focuses on the younger generation and the teenagers who are now the new targets of Ghostface. Jill Roberts (played by Emma Roberts) is Sidney's cousin who, along with her friends, start receiving mysterious threatening phone calls and attacks from the masked killer. This generation love the humour and camp of the original "Stab" films while not taking the threat serious until more bodies start to pile up. New rules are defined and a new killer is on the loose but which of the new teens will even make it to a sequel? The Good: I know when I was watching this movie with my friend Nikki, I reverted back to my six year old self and became a fanboy again so I'll highlight all the great points. This movie brought a legitimate sense that this was a horror movie. I know that sounds a little confusing but if you think about the string of movies we've had in the last 10 years that were "horror movies" that tried to scare us; there was only gore and flash instead of suspense. 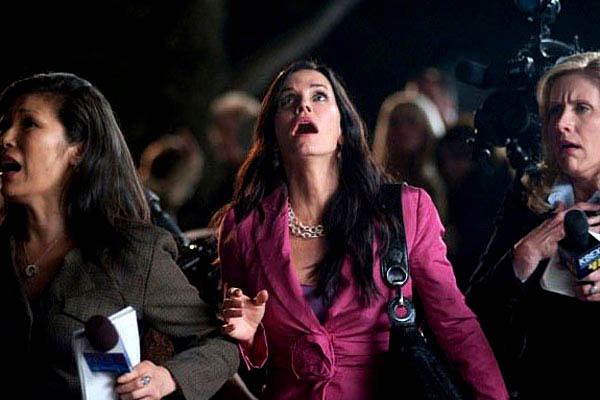 Scream 4 definitely brought back this suspense and paranoia that kept us at the edge of our seats. It was never just dead air and then the killer jumps out with loud music to scare us then went back to nothing; there was anticipation that you knew Ghostface could appear any minute. I have to say that the murder scenes and twists were great. After coming on the heels from Scream 3 and the lackluster deaths from that film, it was a nice change to see something new and not a paint-by-numbers string of events. The first 10 minutes alone were shocking! We all had heard that four well-known actresses (Anna Paquin and Kristen Bell vs. Lucy Hale and Shanae Grimes) were going to appear in the opening kill but distinguishing which two were the real victims and the two that were part of the "Stab" franchise to psych us out kept us guessing. I had made a guess and I thought I was right for a split second then a twist happened and I was proven wrong. I was not expecting what came next at all! Finally, the big reveal at the end with whom the killer is was actually believable. Sometimes a horror movie throws in a random character with an explanation that completely comes from left field leaving us to wonder who came up with this idea. The killer's reason this time actually made some sense to why they did it compared to random secrets and the urge to kill in reference to some lackluster films in our past. To be honest, I actually didn't realize who the killer was until five seconds before they pulled off the mask. I'm great at mysterious and guessing the end story but this time I got the killer wrong and I loved that! The Bad: There are only two things that I didn't like about this movie. While I did think that all the death scenes in this film were great, there was only one death that I absolutely hated because it kept trying to make a joke. Like come on! You can extend a person's death scene in a movie for a short while but everyone in the theatre was laughing because it was overacting 101 and ending with such a idiotic joke. It was a hilarious moment and Scream is known for making fun of the random death scenes but this one was somewhat unnecessary. The final thing that I think this movie was missing was a great chase scene. There were a couple of good scenes throughout the film with Ghostface running after the victim but nothing that compared to the anticipation of what we'd seen in previous films. Even at the end, there was a mini chase but not one that left you worried that the killer would appear at the next second to cause Sidney some grief. It didn't make an overall impact on my opinion of the film but it would definitely have added a nostalgic aspect to the film to put us in the point-of-view of the heroine. The decision with this score is not based on the fact that I loved this series and loved this film; it was just generally a great film. The acting was good and the atmosphere of of Scream 4 was perfect; Kevin Williamson and Wes Craven brought back the suspense and horror that we truly needed with this series. The past horror movie references were fun and not used in a convoluted way. Scream 4 brought a great mix from the older survivors to the fresh new young cast. I would recommend people to watch this film even if you don't like horror movies because in no way is this a movie that focuses on being the scariest. I would love if this film was the beginning of a while new trilogy but the way it ended, I wouldn't be surprised if it was the last. Let's cross our fingers people! Agree or Disagree with the review? Post your comments below and share your thoughts with what you thought about the movie!